Leucopogon fasciculatus (Ericaceae); formerly Cyathodes fasciculata, and placed with other related species in a separate family, Epacridaceae, now regarded as part of the Ericaceae [heath family]). Proto Polynesian *Nukanuka, Decaspermum fruticosum (a tree with hard wood and healing properties, Myrtaceae) + lau "leaf", + riki "small"
This is a small tree, growing throughout Aotearoa to a height of 5-6 metres in a variety of environments (forest, rocky places, scrubland). 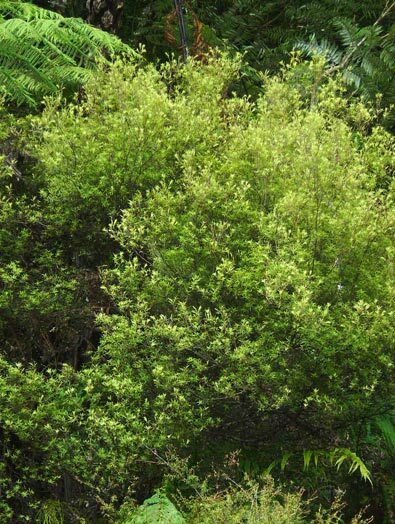 The name mānuka rauriki means literally "small-leaved manuka", and is also applied to the kānuka (Kunzea ericoides). The other (and probably more commonly used) name mingimingi is one of the plant names apparently originating in Aotearoa. It may well be the heath-like appearance of the kānuka that inspired the alternative name, mānuka rauriki, for this tree. 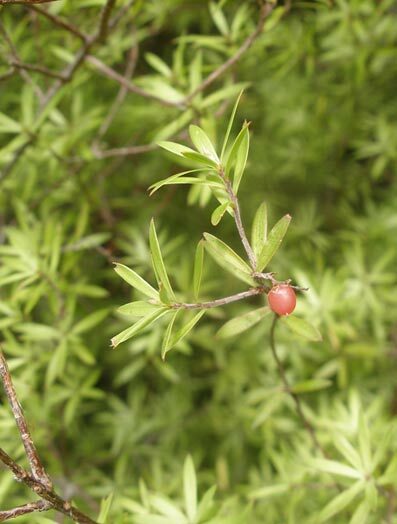 That quality is reflected also by the kanuka's botanical name, Kunzea ericoides, which means "the heath-like Kunzea". 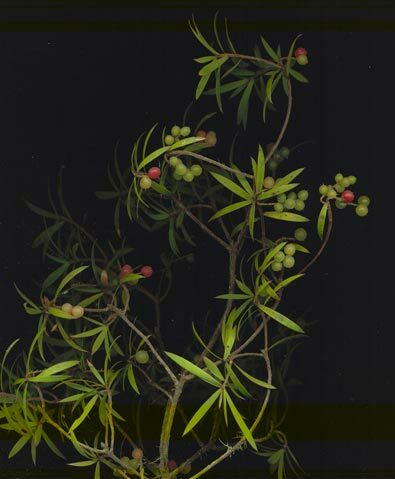 The kānuka certainly does have small leaves, and for many decades was grouped by botanists in the same genus (Leptospermum) as the other, larger-leaved "mānuka" (L. scoparium) .The mingimingi's leaves, however, while similar in form to those of the other trees, are considerably larger than those of either of its namesakes. However, with its general appearance (illustrated in the photograph by Wayne Bennett, above) and small flowers, it certainly could be perceived at first glace, especially from a distance, as a variety of kānuka. Up close, one might find that the leaves have suddenly been magnified, thus making it a rather long-leaved short-leaved mānuka! Botanically, however, it belongs to a different family of plants, the heaths (Ericaceae), whereas Leptospermum and Kunzea, like the pōhutukawa, are members of the myrtle family (Myrtaceae). 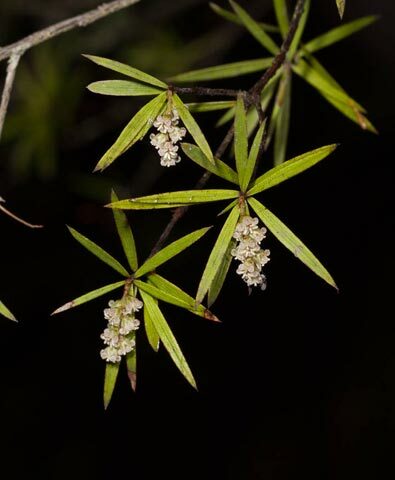 References and further reading: See the NZPCN page devoted to this plant, and general works on NZ shrubs and trees in the bibliography. There is also information and a gallery of excellent pictures of the mingimingi on the University of Auckland NZ Plants website. Photographs: We are indebted to Wayne Bennett, Mike Thorsen and the late John Sawyer, all members of the NZ Plant Conservation network, for the photoographs illustrating this page.